What lies ahead in the hotel industry? Hospitality Lawyer looks at the good, the bad and the ugly . . . and something we haven’t seen in 20 years! Hospitality Lawyer: What lies ahead for the hotel industry? 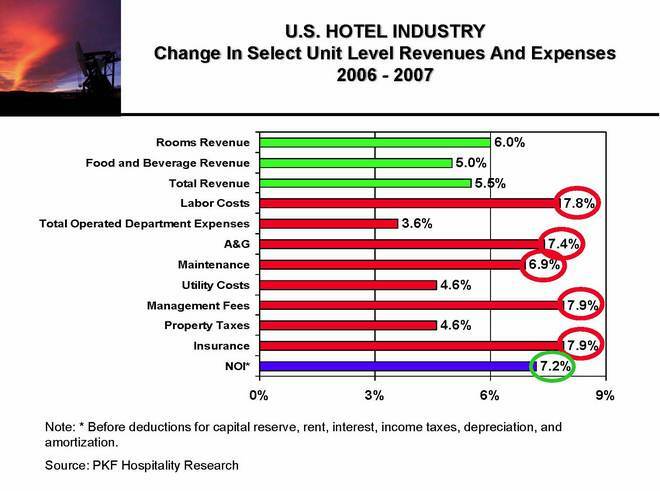 On July 17, 2008, at the NABHOOD Conference in Atlanta, the experts gave us the latest update on the Hotel Industry since NYU. (See the 5-part series at www.HotelLawBlog.com analyzing the data available at June 1, 2008 at “Quips, Quotes and Insights from the 2008 NYU hotel conference.”). You can also find the Top 10 Picks from www.HotelLawBlog.com by clicking here. Here’s Mark Woodworth’s analysis of “What Lies Ahead,” and it is very interesting . . .
U.S. Lodging Horizon 2008: What Lies Ahead? Recession ahead . . . but how bad? Moody’s Economy.com’s current outlook drives PKF’s forecasts, and that outlook shows a 90% probability of recession, with a 51% chance that the recession will be mild and 25% chance it will be a slow recovery. 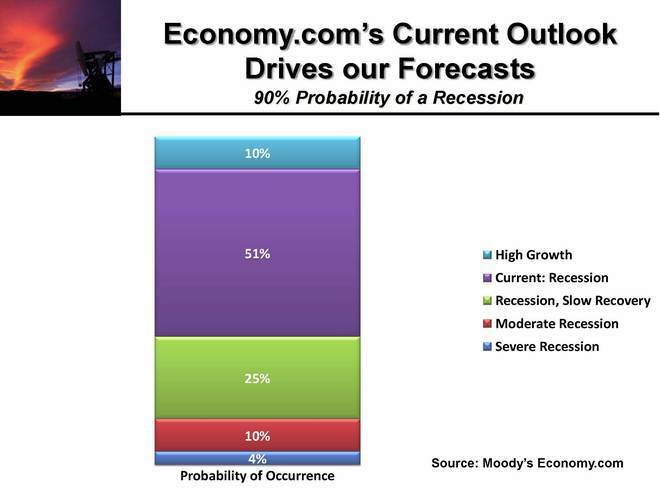 There is only a 10% chance the “mild” recession will worsen to “moderately” severe (about the same chance as a “high growth” scenario), and 4% chance of a “severe” recession. 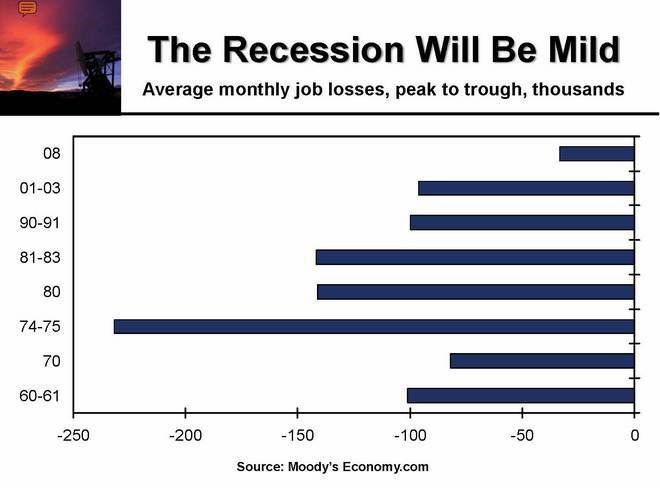 So we are likely to have a recession, but compared to the last 7 recessions, it will be quite mild, at least as measured by average monthly job losses. The following chart shows projected job losses for 2008 recession (the shortest bar in the graph at the top right), compared to past recessions identified along the left margin of the graphic. 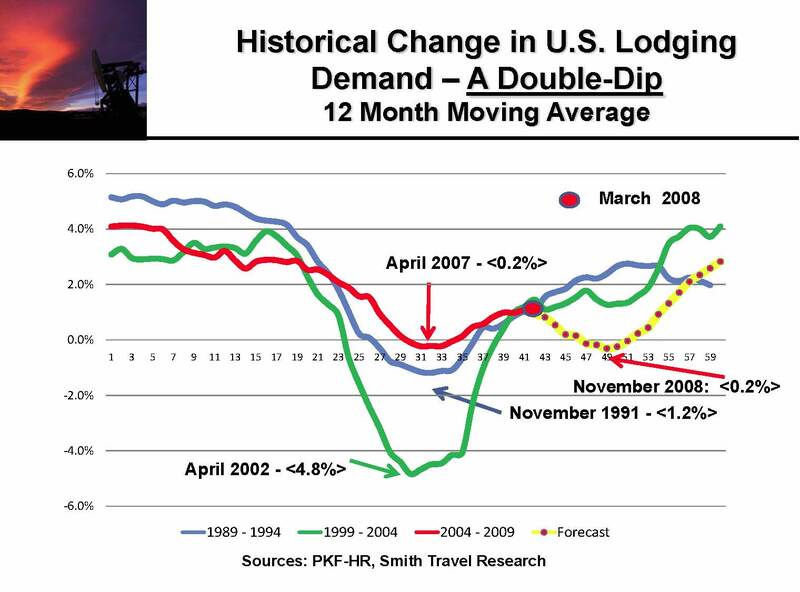 If we compare the current downturn to the last two — which troughed or bottomed in terms of lodging demand in 1991 and 2002 — the current scenario is quite mild. But it is also unique, because PKF now foresees that we will have a “double dip” in demand. The first dip occurred in April 2007, and they believe the second dip will trough in November 2008. 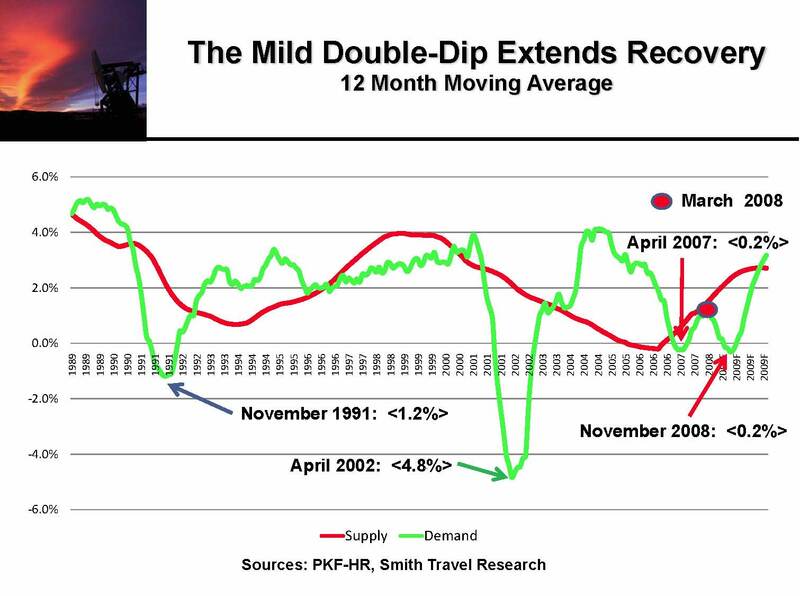 So what does the “double dip” mean for the hotel industry? It means that continuing declines in demand through November will delay or push out the recovery. The following chart shows this projection and also shows one of the critical differences distinguishing the current down turn from the last two. In both of the last two recessions, there was a significant increase in hotel room supply for some period prior to the downturns. This time around, supply growth steadily decreased from about 2000 through 2006, and even today is below the long term average. Don’t lower your rates to make up for sagging occupancies! PKF gives its projections on increasing ADRs by market segment (see slide show), but one important take away is becoming a mantra for owners in the current environment: Lowering rate to try to compensate for sagging occupancy is a bad strategy, and you are better off holding rate and taking a little lower occupancy. Watch out for rising expenses. It does not take a rocket scientist to know that a lot of operating costs are going up, but this slide really highlights the dangers with a look back to changes in revenues and costs from 2006 to 2007. 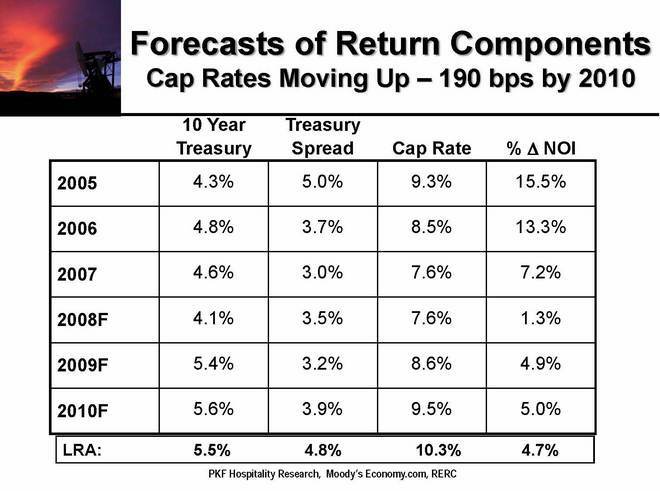 Mark Woodworth is forecasting the cap rates will increase by 190 basis points between now and 2010. 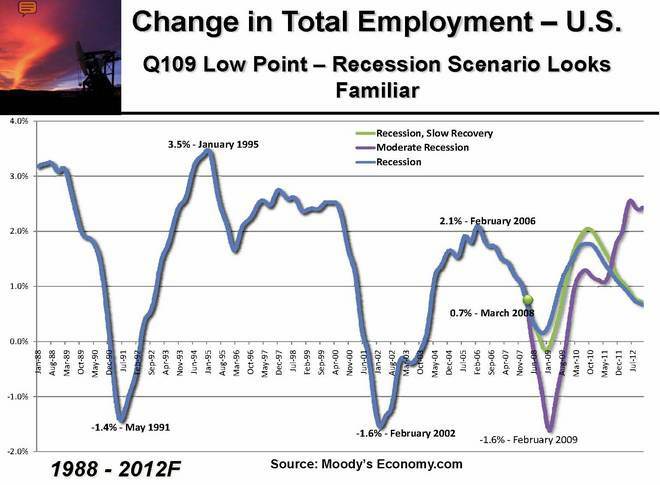 In fact, he predicts they will rise from 7.6% forecast for 2008 to 9.5% in 2010. In addition to cap rates, this slide also shows 10 Year Treasury rates, Treasury spreads, changes in Net Operating Income (NOI), and Long Run Averages (LRA) for each component. To download and see the full slide show presented by Mark Woodworth, click here. Hospitality Lawyer’s take on things. This current environment continues to provide great opportunity and . . .danger. Fortunes will be made . . . or lost in the coming months.